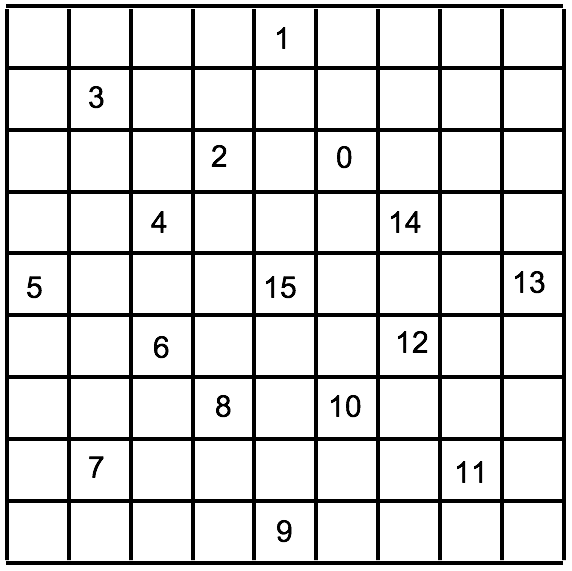 The knight can be trapped in 15 moves as shown in the figure. a = 1 and b = 135. Ana sees 136 on Boris and knows whatever product Boris sees (1 × 135, 2 × 134, 3 × 133, etc. ), he can’t know his number. Boris sees 135 on Ana and considers he may have 3 + 45 (= 47 + 1), 5 + 27 (= 31 + 1), 9 + 15 (= 23 + 1), or 1 + 135. The first three possibilities are eliminated by adding to one more than a prime (which would disallow Ana from making her statement) so Boris deduces his number is 136.